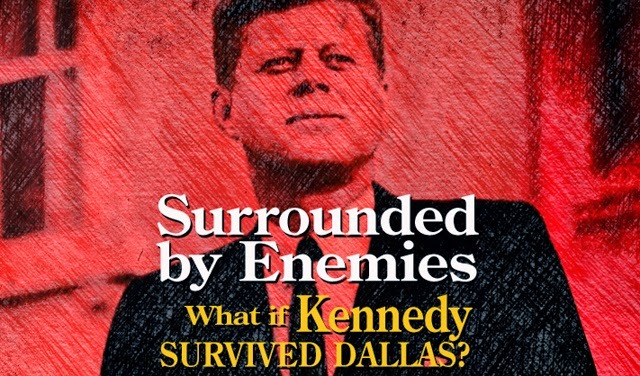 'SURROUNDED BY ENEMIES: What If Kennedy Survived Dallas?' Review | Warped Factor - Words in the Key of Geek. Ever since the events of November 22, 1963 there has been much speculation regarding the assassination of President John F. Kennedy. There's been debate over whether accused assassin Lee Harvey Oswald was even involved, what forces may or may not have been behind the assassination and so forth. There's also been the question of what might have happened if he had survived the assassination attempt. Many have tried answering that question with movies and books, some more fantastical than others. Few though have perhaps been as authentic in their portrayal of a post-Dallas Kennedy presidency than Surrounded By Enemies, Bryce Zabel's Sidewise In Time award winning novel. Zabel is no stranger to the JFK assassination, having been co-creator of the “brilliant but canceled” 1990s sci-fi/thriller television series Dark Skies which had the assassination at its center. Zabel also puts his knowledge and research about the period to use here as well. Surrounded By Enemies presents a compelling portrait of a 1960s where not only did a conspiracy attempt to kill the President of the United States in broad daylight fail, but also led to the Kennedy brothers having to figure out who to trust as they struggle to deal with not only the aftermath of Dallas but the 1964 election and beyond. It's that which is what separates this novel from so many other alternate history works. Many of them, such as the film Timequest, take a “rose-tinted” look at the world post-Dallas where it seems that the forces that nearly killed JFK simply give up or are easily dealt with. Zabel's take is far more plausible. To paraphrase a line from the novel itself, it turns out that there is more than one way to assassinate a nation's leader besides killing him. Those familiar with recent American History and the scandals surrounding two of Kennedy's successors will find plausible echoes as the novel progresses and eventually ties into Kennedy's private life and its effect on his presidency. The results seem all too plausible. To tell this story, Zabel chooses not to employ the usual novel techniques. If one goes into this book expecting to be given unfettered access to the thoughts and world of Surrounded By Enemies, you might be in for a disappointment. What Zabel does instead is something that makes the events far more plausible. Via a fictional weekly news magazine called Top Story and its commemorative issue looking back on the events in Dallas, we're given a look at twenty-odd months between November 1963 and February 1966, with an epilogue. Zabel's choice gives the proceedings an air of authenticity that some works of alternate history lack, and also saves both historical figures from having too many words shoved in their mouths and the reader from having to question the plausibility of those words. Yet, often like history itself, the results can also be frustrating as we're presented with a sometimes incomplete picture of events and details. Even that potential flaw though lends the work credibility, as anyone familiar with the Kennedy presidency, let alone the assassination, will be aware of how lacking of a full picture history can sometimes leave us with. Overall then, it's hard not to rate Surrounded By Enemies highly. Bryce Zabel's novel, told in the style on a non-fiction work, presents perhaps the most plausible picture we've yet had of what JFK's post-1963 presidency might have been like. For those interested in Kennedy, or fans of alternate history as a genre, this book comes recommended.